If you stop to look for it, the number of times the NT quotes the OT is staggering. Roger Nicole finds at least 295 unquestionable quotations, and estimates of the number of allusions and references run from the 600s to over 4000. Nicole estimates that over 9% of the NT is made up of OT material. We don’t always catch these allusions, and when we do sometimes they’re confusing. For example, doesn’t it look like Peter quotes contradictory passages in Acts 1:20? And what does Hosea talking about the Exodus in Hos 11:1 have to do with Jesus’ family returning from Egypt in Matt 2:15? There are lots of times when it looks like the NT authors are interpreting the OT in a way we would never feel comfortable doing. 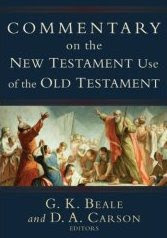 Because of tough passages like this, and because of lots of other little details we’re likely to miss, I’m excited about a new reference book that came out this fall, Greg Beale and D. A. Carson’s Commentary on the New Testament Use of the Old Testament. This book is the product of about 20 years’ worth of research by the various authors, and it’s massive: over 1200 pages, covering almost every NT book (apparently Paul doesn’t quote the OT in Philemon), with a Who’s Who of NT scholars as the contributors. For each quotation or allusion in a NT book, this work goes through the NT context, the OT context of the passage quoted, its use in Jewish sources prior to the NT, the textual background (including which version of the OT is probably followed), the type of interpretation the author uses (is it direct predictive prophecy, a double fulfillment, or a prooftext? ), and the theological use. The amount of information is almost overwhelming, but for close study of a passage that references the OT this book is invaluable. For example, in the Matthew 2 passage I referred to earlier, Craig Blomberg clarifies that Matthew is probably not saying that Hosea in Hos 11:1 foresaw Jesus’ family going to Egypt and coming back to Nazareth, but that he’s pointing to Jesus’ return from Egypt as an example of his representing his people Israel. The whole passage makes more sense as a result. This book is a great reference for preaching and teaching, and even for personal Bible study. Having it on your shelf will help you ask and answer hard questions of the Bible, and minimize the times when you shrug your shoulders and move on without understanding what you just read. It shows the organic way in which God inspired the Scriptures, and it helps us to be honest in our interpretation of both the OT and NT.